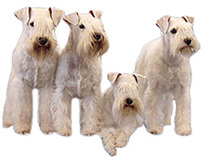 A white Schnauzer is virtually always a Miniature Schnauzer - there are almost no white Standards or Giants. They used to be quite rare, but are becoming increasingly popular, along with parti (colored) mini schnauzers. They are NOT albinos, as their skin has pigment. For those of you interested in the technical reason for whites, they are Schnauzers which carry the double recessive e/e gene. 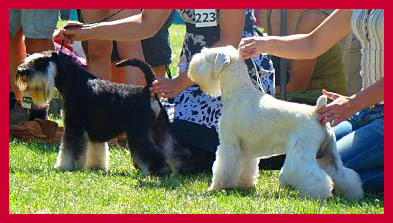 Some people think that Miniature Schnauzers were bred with Westies (West Highland Terriers) to create the white color. That's not true either and although they can look a bit similar, they are two completely different dog breeds with different characteristics and temperaments. If you buy a nice white car and are unlucky enough to have a bump in it, you'll realise there's lots of different types of white paint when you come to do the repairs .... Well, white Schnauzers are a bit the same! A no color is a dog with a pure white coat. They are born with pink lips, pads and noses which later turn the base color. (The natural color of the nose and paw pads is the dog's base color and can be brown or black). A true white is also known as black-nosed white - no prizes for guessing why - see photo on right. A white chocolate is also called a brown-nosed white (the clue is in the name again!) This is genetically the same coat is the black-nosed white, only the base color is brown, not black. False white, platinum silver and wheaten are all variations of white Schnauzers. False whites are born a tan color, but lighten to white when they are fully grown. Wheaten minis are more of a yellowy white (with a brown base color) and platinum miniatures have more of a silver colored coat with a black base color. Miniature Schnauzers were first created by reducing the size of - or “breeding down” the Standard Schnauzer. German breeders did this by crossing the Standard with various other breeds of dog, such as the Affenpinscher. In the late 19th century breeders had far less understanding of genetics than they do now. By crossing the Standard with different colored dogs, they actually produced Miniature Schnauzers in a 3rd color - black and silver. It's often said that gelb meant white , but there is no definite proof of this. 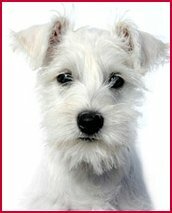 But when hand stripped, most white Schnauzers with the proper wiry coats have a yellowish streak on their backs and heads. It's thought this is why they were originally called "yellow" in German records. The breeders of whites claim that they occur naturally - like black and silver Schnauzers - and therefore should be fully accepted. If you do decide to get a White Schnauzer, you may not be able to show him in major AKC or UK Kennel Club shows, but that doesn't mean he won't make a fantastic pet. The main problem with puppy mills is that they often breed puppies of poor genetic stock. 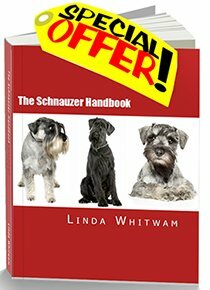 This can lead to health and temperament problems later on - causing a lot of heartache for the poor family or person who bought the Schnauzer puppy in good faith.